The key to Caen, Sword Beach in Ouistreham, Normandy, was the beginning of a month of ferocious fighting after the D-Day landings. Easternmost of the D-Day Landings beaches, Sword Beach, 17 km (11 miles) due north of Caen at the seaside resorts of Ouistreham and Lion-sur-Mer in Normandy (map), was the key to conquering Caen and controlling its important network of roads, railroads, and its port on the Orne River. United Kingdom troops landed at Sword on D-Day, June 6, 1944, but the swift conquest of Caen envisioned by Field Marshal Bernard Montgomery did not come about, giving the German occupiers time to bring up several crack Panzer tank units to put up a determined defense. The battle raged for a month, leaving the city in ruins. Today Sword Beach is a popular seaside summer resort area, with fine sand on a wide beach, blue waters, beach services, hotels, restaurants, casinos, and an utterly different ambience than that on D-Day, when the greatest amphibious invasion in world history was under way. The small Musée du Débarquement "SWORD" (Museum of the Landings: SWORD), facing the casino and the beach in the center of town, keeps alive the heroic events of 70+ years ago. 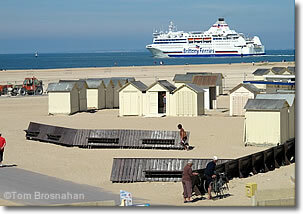 Sword Beach in the Normandy coastal port of Ouistreham, with a car ferry departing for Portsmouth, England.